Murphy residents, Alejandro Martinez-Munoz and Gabriela Tamez-Martinez, purchased a Sunfinity Solar franchise in July of 2017. They had known they wanted to be a part of the solar industry for many years because, “We want to save the world.” They see solar power as a sustainable power solution. He points out environmental reasons readers should choose Sunfinity Solar, “You will be cleaning the environment, reducing your carbon footprint and creating a more sustainable world.” He also addresses financial reasons to go this route, “You are very likely to save money.” He said his commitment to customers is to provide a set of panels that will reduce, and probably eliminate, their electric bill. A typical loan for solar panels costs $120 a month over 20 years. He points out that electric bills fluctuate over time for your entire life, but this loan will remain the same and have an end date. If customers would like to pay for the system with cash, that is also an option. Solar panels increase the value of homes. Some electric companies offer rebates if a person chooses to install solar panels because it will lessen the demand on the electric companies’ resources especially as the companies consider the growth coming to North Texas. In January of 2018, the Martinez-Tamez family had Sunfinity Solar panels installed. They were given a $500 rebate from Farmers Electric and shared their electric bill comparisons: Jan. 2017 ($105), Jan. 2018 ($44 because the solar panels were installed half way through the month) and Feb. 2017 ($198), Feb. 2018 ($0 full month with solar panels). He points out that even though this past February was extremely rainy and cloudy they still had a $0 electric bill. They are considering donating an LED street light which will be powered by solar power at the corner of Heritage Parkway and Betsy Lane. They will meet with City of Murphy staff to discuss possibilities. In addition to solar panels they also sell exterior solar powered LED lighting solutions. Alejandro said they provide free estimates and analysis with technical details and financial comparisons. They will manage HOA permits. He said that legally HOAs cannot prevent homeowners from installing solar panels and that homeowners should not expect any issues. They will have a booth at the Chamber of Commerce Spring Fever on April 14, 10 am – 4 pm in the Lowe’s parking lot. They invite you to come by and meet them there and learn more about Sunfinity. 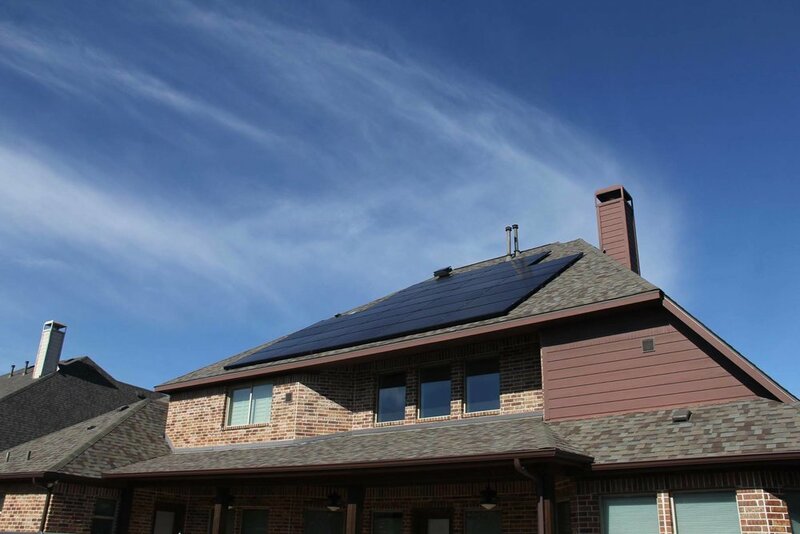 Homeowners and business owners are encouraged to contact Alejandro (972-814-4392 amm@sunfinitysolar.com) or Gabriela (972-437-9891 gtamez@sunfinitysolar.com) to schedule an appointment.